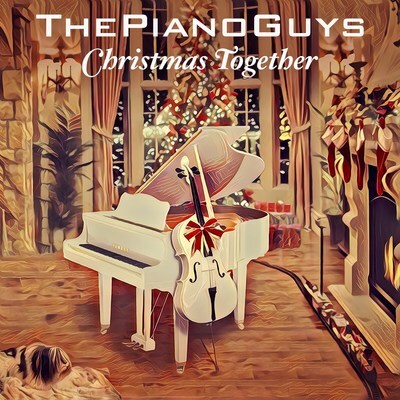 NEW YORK, Oct. 27, 2017 /PRNewswire/ -- With over a billion YouTube views for their 50 plus music videos, The Piano Guys announce the release of their new holiday album Christmas Together (Portrait) available October 27. The album features collaborations with music royalty from the pop, opera, and video worlds on classical themes, holiday chestnuts, and original compositions. Their seventh full-length studio album and second holiday collection, Christmas Together brings The Piano Guys' "Wonders of the World" quest back home for the holidays after their last album, Uncharted, found the Utah quartet roaming far afield to places like Scotland, Mexico, and Jordan. Both words in the title, "Christmas" and "together," are equally important – in more ways than one. The 11 stellar songs on Christmas Together reflect holiday-time togetherness. They bring leading and legendary vocal talent together to make music that is more than the sum of its parts. Plus, they blend Bach, Beethoven, and Händel together with yuletide classics like "Little Drummer Boy," "I Saw Three Ships," "Hark! The Herald Angels Sing," and "Do You Hear What I Hear?" The album opens with a burst of togetherness, featuring YouTube star Peter Hollens, pop sensation David Archuleta, and the legendary Mormon Tabernacle Choir lifting their voices in song on "Angels from the Realms of Glory." And "Silent Night, Holy Night" boasts vocals from Plácido Domingo backed by the children of the famous Cathedral School Choristers. British acappella legends The King's Singers lend their own gorgeous vocal textures to an exquisite arrangement of J.S. Bach's "O Little One Sweet," while angelic-voiced young star Lexi Walker helps lift a medley of "O Holy Night" and "Ave Maria" to soaring heights. Christmas Together builds on the foursome's history of defying genre and chart limitations. Cellist Steven Sharp Nelson expresses the group's musical aim this way: "We hope it transcends conventional classification and instead reaches beyond boundaries, finding audiences from all walks of life that want positive content and fresh takes on old and new music." The Piano Guys' recordings have always been tapestries of inventive, inspiring songs with multigenerational appeal, and that goes double for their holiday releases. The Piano Guys – Steven Sharp Nelson, Jon Schmidt, Al Van der Beek and Paul Anderson – became an online sensation by way of their immensely successful series of strikingly original self-made music videos, which has far surpassed 1 billion views and garnered over 5 million subscribers on YouTube. They've made over 50 music videos since 2011, including their breakout hit, an innovative multi-handed version of One Direction's "What Makes You Beautiful" and a gorgeous reinvention of the hit song "Let It Go" from Disney's Frozen. Christmas Together is the Utah-based classical-pop group's seventh major label album on Portrait/Sony Music Masterworks, following: Wonders, The Piano Guys, The Piano Guys 2, A Family Christmas, The Piano Guys – Live! and Uncharted.